Ranger, a fast gentleman's racing schooner with a drop keel, has a remarkable history and is listed as an historic Great Lakes vessel by the Bowling Green State University in Ohio. Last November. she celebrated 100 years of sailing! Built in 1914, by Henry B. Burger Jr. in Manitowoc for a local businessman R.B. Brown, Ranger was designed by naval architects, Charles Drown Mower and Thomas D. Bowes, of Bowes and Mower of Phildelphia. Ranger sailed on the Great Lakes for 25 years until April, 1939, when R. B. Brown retired as President of the utility Madison Gas and Electric and decided to head for land he held in the Orcas Islands near Seattle in Washington State - taking his beloved boat with him. The journey was well planned. 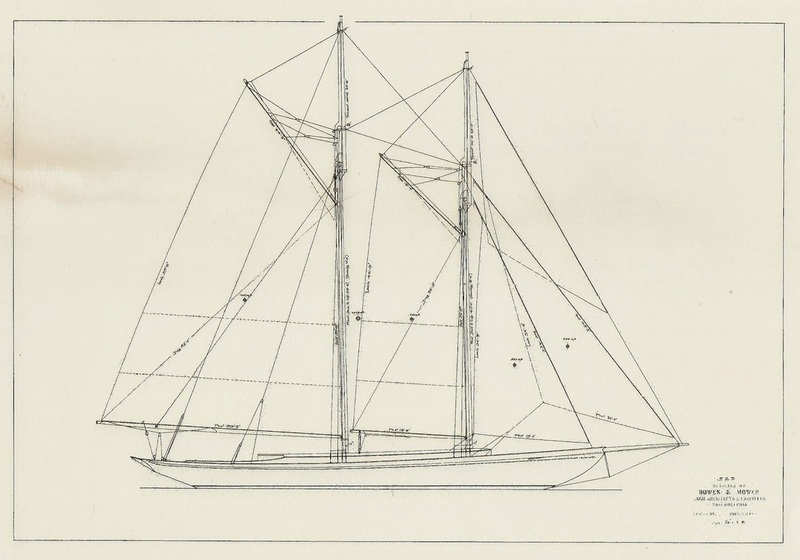 Ranger had sailed and raced on the Great Lakes with a 50 hp engine, but Brown realised that his epic journey would require changes in his schooner. He installed a 'modern' motor and 2 new masts, as well as a radio telephone for ship to shore communication. An experienced radio operator was taken on as crew - together with a 20 year-old student, John Findorff, who later inherited his father's company and went on to head Findorff Construction. His log of the journey has just been located. It covers their journey from Milwaukee to Chicago, down the Illinois river to the Missippi and the Gulf of Mexico, and on to the Panama Canal and up the Pacific Coast to the Orcas Islands. Brown continued to own her until 1946 - a total of 36 years! Although, she was taken over by the U.S. Maritime Administration and used as weather ship by the U.S. Coast Guard, 1942-1945. In 1946, Brown finally relinquished his schooner and H:M Fierell became her new owner. After that she changed hands regularly, ownership changing on average every 4 years. After that she remained on the Pacific Coast, changing owners over a period of time and eventually coming to be loved by those sailing on her to Santa Catalina. Then, Prince Stanilas Klossowski Count de Rola fell in love with her and Ranger changed hands and left US Registry. Her new owner, also known as Stash Klossowski, planned to use her as a personal yacht and charter her in Costa Rica, as Racy Ranger. She could not retain her name under US registry, as Stash was not a US citizen. So she became Racy Ranger under a Cayman Flag. Sadly, after so many years on the sea, age was affecting the schooner. She was hogged and nail sick. And she proved hard to maintain. Languishing on a mooring off Panama's Causeway, she was caught by a rogue wave over the stern and sank in June 2006. Racy Ranger was raised after two weeks and put on the hard at Flamenco Marina. The extent of her aging became apparent. She was hogged, and her planking and ribs were nail sick. It was time for a face lift. A Swiss consortium took over. For a time she became Sea Phoenix, but the old name and history have reclaimed her. She is and always will be RANGER. Hope is that she will return to her gaff rigging and Bowes and Mower's sail plan. Work started in November and December 2006. The boat was constructed as close to original as possible. The original swamp wood frames were 2x4's bolted together to make 4x4' s. They were replaced with 4x4's of Guayacan - Ironwood. The wood was available and gave great strength. Guayacan - a tropical hardwood has great resistance to rotting from water. Swamp wood is no longer available. The fastenings - like the original - are galvanised double dipped, which should give the boat another good 40 years service. The cost of stainless or bronze fittings would have escalated the cost of the restoration. Rising metal prices and the variable quality of stainless available were a concern. For this reason, the tried and true orignal fastenings - hot dipped galvanised - were selected. The bow was raised 4 inches before the stringers were attached, using a hydraulic jack. Photos documenting her some of the rebuild are shown below. Planking over Guayacan ribs continued. Mahogany arrived with all the correct Anam permissions. Water and fuel tanks were built for the bilges.